1910 United States. Bureau of the Census. 13th census, 1910 population census schedules, Washington, District of Columbia: Bureau of Census Micro-Film Lab, ([19--?]) , WISCONSIN > JACKSON > 4-WD BLACK RVR FALLS, Series: T624 Roll: 1713 Page: 139. 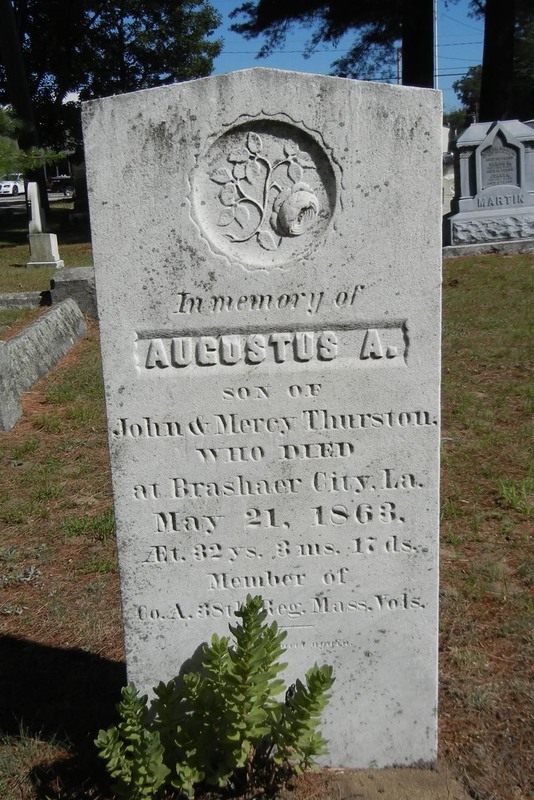 In memory of Augustus A. son of John & Mercy Thurston, who died at Brashaer City, La. May 21, 1863. AEt. 32ys. 3ms. 17ds. Member of Co. A, 38th Regt. Mass. Vols. William Richard Cutter, Historic Homes and Places and Genealogical and Personal Memoirs Relating to the Families of Middlesex County, Massachusetts, New York: Lewis Historical Publishing Company, (1908) , p. 911. Brown Thurston, Thurston Genealogies., Portland, Maine: Brown Thurston and Hoyt, Fogg & Donham, (1880) , p. 270. Find A Grave Memorial# 42160637. "United States Census, 1920," database with images, FamilySearch (https://familysearch.org/ark:/61903/1:1:MX1R-MY3 : accessed 4 April 2016), Carrie T Grant, Wrentham, Norfolk, Massachusetts, United States; citing sheet 6A, NARA microfilm publication T625 (Washington D.C.: National Archives and Records Administration, n.d.); FHL microfilm 1,820,722. 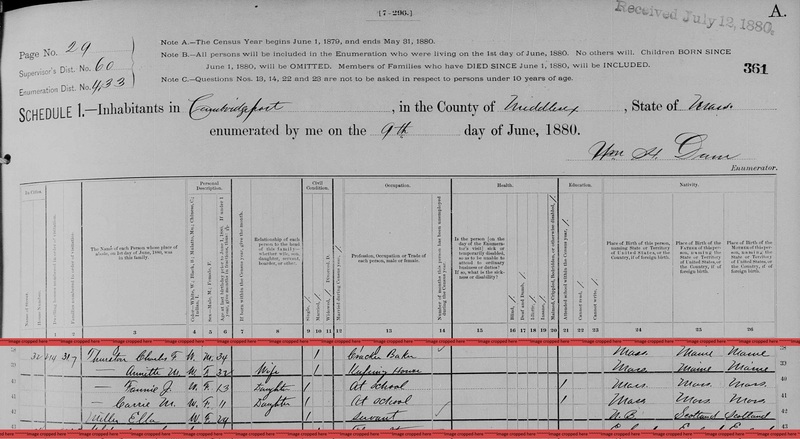 "United States Census, 1930", database with images, FamilySearch (https://familysearch.org/ark:/61903/1:1:XQ5D-DX5 : accessed 4 April 2016), Carrie P Grant, 1930. Find A Grave Memorial# 101438042. He lived in Cambridge until 1892, when he removed to Malden, Massachusetts. 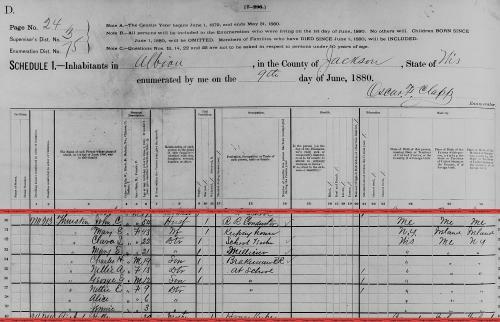 Brown Thurston, Thurston Genealogies., Portland, Maine: Brown Thurston and Hoyt, Fogg & Donham, (1880) , p. 343.
International Genealogical Index (IGI) (, 1999), Batch Number: 8518980, Sheet: 14, Source Call No. : 1396049. Brown Thurston, Thurston Genealogies., Portland, Maine: Brown Thurston and Hoyt, Fogg & Donham, (1880) , p. 252. Brown Thurston, , p. 331. 1880 United States. Census Office. 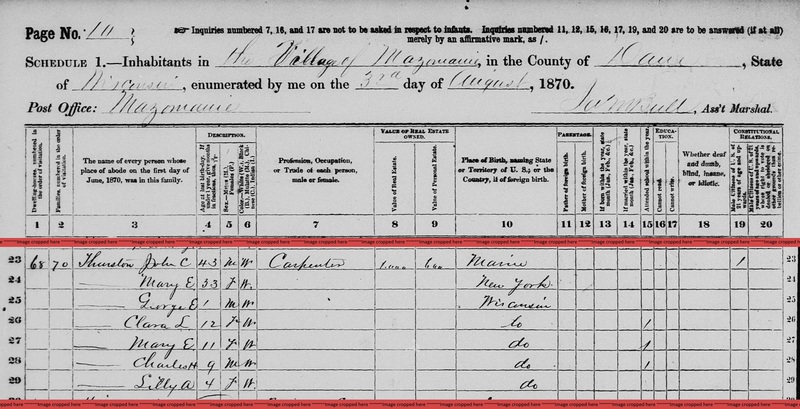 10th census, 1880 federal population census, Washington, District of Columbia: National Archives and Records Service, ([19--]) , FHL Film 1254543; National Archives Film T9-0543; Page 41D. She was the daughter of Charles Frederick Thurston and Annette Maria Holden. "Massachusetts Deaths, 1841-1915," database with images, FamilySearch (https://familysearch.org/ark:/61903/1:1:NWFM-K26 : 10 December 2014), Fanny J. Thurston, 24 Mar 1903; citing Newton, Massachusetts, v 540 cn 123, State Archives, Boston; FHL microfilm 2,057,764.
International Genealogical Index (IGI) (, 1999), Batch Number: 8427701, Sheet: 87, Source Call No. : 1395873. "Maine, Births and Christenings, 1739-1900," index, FamilySearch (https://familysearch.org/pal:/MM9.1.1/F4Q8-23J : accessed 28 Nov 2012), Harriet H Thurston, 24 Apr 1822; citing reference p 84, FHL microfilm 11727. Brown Thurston, Thurston Genealogies., Portland, Maine: Brown Thurston and Hoyt, Fogg & Donham, (1880) , p.220, #4508. 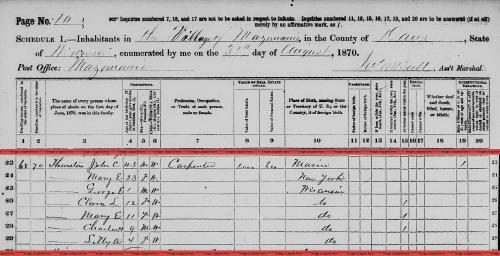 "Maine, Births and Christenings, 1739-1900," index, FamilySearch (https://familysearch.org/pal:/MM9.1.1/F4Q8-2QB : accessed 19 Dec 2012), Hiram L Thurston, 04 Aug 1828; citing reference p 84, FHL microfilm 11727. 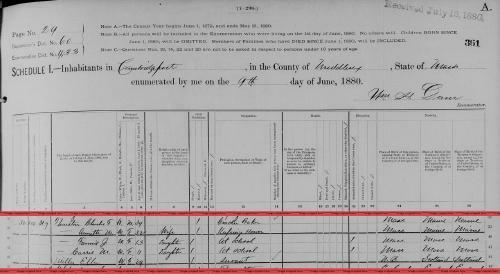 "Wisconsin, Births and Christenings, 1826-1926," index, FamilySearch (https://familysearch.org/pal:/MM9.1.1/XRBM-BYN : accessed 05 Dec 2012), John Colby Thurston in entry for Thurston, 25 May 1877.